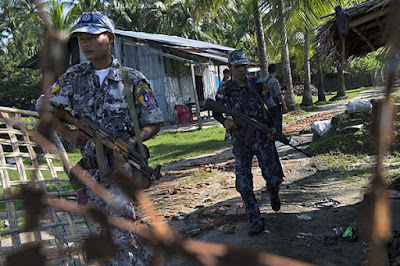 Are there Rohingya terrorists operating in N. Rakhine State, with international support? Joseph Allchin's solid analysis of Rohingya militarist group has just destroyed Bertil Linter's rubbish on the same subject. "There is no sign yet that the Rohingya insurgent group has allied itself with outside jihadist groups. Indeed, ARSA’s decision in March to drop its Arabic name in favor of a more secular-sounding English one suggests that ARSA has not been subsumed by any transnational Islamist extremist organization. The group’s charismatic leader, Ata Ullah, does have connections in both Pakistan and Saudi Arabia, and was brought up in the Pakistani port city of Karachi, believed to be where the al-Qaeda leader Ayman al-Zawahiri is being sheltered. But as is evident from ARSA’s modest capabilities and lack of weaponry, efforts by Ullah to solicit support from groups like Lashkar-e-Taiba and the Taliban have so far not borne fruit." I have long concluded that Bertil Lintner, treated falsely as the most credible journalist on my country's affairs, has no professional integrity when it comes to the issues related to Muslims and Rohingyas. (You can publish 10 books on the subject, and still don't have your finger on a country's pulse). He told my close friends from Mandalay that he knew that Myanmar Military would use anti-Muslim racism in Burma targeting Rohingyas and Muslims in general, in 2011, about 1 year before June 2012 bout of violence broke out. But Lintner never penned a single op-ed to alert the world of what he said he knew: a state's premeditated attempt at racially and religiously motivated campaign of terror, for strategic ends. Instead he started changing even what he wrote about Rohingyas - particularly attacking Rohingyas' identity. Worse still, he has been pumping out alarmist essays tailored to the paranoid "war-on-terror" intelligence and policy circles, blowing Rohingyas' alleged ties to the international terrorism. His protege Aung Zaw at Irrawaddy uses Lintner's wild exaggerations - packaged in minute, but useless details about terrorist connections designed to impress the readers and establish his authority on the subject. Asia Times website has become the main platform from which this alarmist "Rohingyas as potential jihadists" message is aired. I don't know who runs the site, what their editorial slants are or what their links and agendas. It is deeply troubling that the issue of international criminality is distorted as "terrorist" concern. The oppressed are of concern to nation-states and governments only if they are framed as remotely threatening to stability and order. The oppression itself is rendered of secondary concern. These discourses of jihadism, international terrorism are not only anti-Muslim racist but they colour the world's public opinion in a bad way. Paranoia that characterises exploitative, predatory and repressive States and their intelligence agencies is a serious cancer that has spread since George W. Bush's 9/11 response. Entire faith-based communities are viewed through this lens of paranoia, and bigotry-based profiling is carried out quietly but routinely. Here is couple of fear-mongering pieces by various writers who operate within this more-or-less "security" framework. Derek Mitchell, my long-time acquaintance from Washington, and former US Ambassador to Burma also succumbed to this policy cancer. As a matter of fact, former Pentagon political appointee, Mitchell was known within Washington circle to have functioned more like a lackey of Myanmar's then widely- - and falsely- touted 'reformist' President ex-General Thein Sein, lobbying Obama Administration, rather than behaving like an American diplomat in Rangoon.